Nantong Economic and Technological Development Zone is among the first group of 14 national-level economic and technological development zones in China. It was established on December 19, 1984 under the approval of the central government. Situated in the southeast of Nantong downtown area, the development zone covers a total area of 146.98 square kilometers, with 140,000 permanent residents. 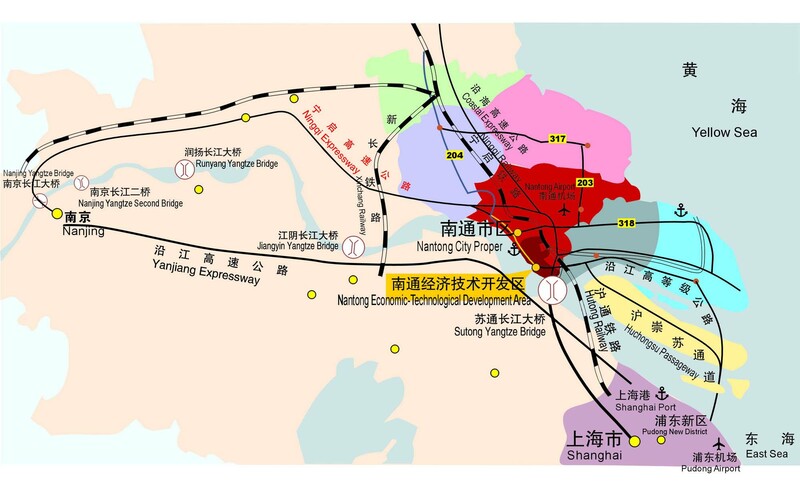 Thanks to the operation of the Suzhou-Nantong Yangtze River Bridge, the largest cable-stayed bridge in the world, and the Chongming-Qidong Bridge, a golden passageway across Yangtze River in eastern coastal areas, the development zone has been fully integrated into the one-hour economic circle of Shanghai city. The development zone has spared no efforts to promote the process of economic internationalization. It has attracted investors from 30 countries and regions. Until now, over 700 companies have been invested by foreign enterprises, including 60 plants run by world top 500 companies. Many companies reached world advanced levels in technological or production capacities. They are separated into six major industrial clusters: modern equipment manufacturing, new materials, new medicines, new energy, modern textile, and service outsourcing. The development zone has grown into an advanced manufacturing base utilizing foreign investment in the Yangtze River delta area and has become a key industrial base in the one-hour economic circle of Shanghai. The NETDA Free Trade Zone got the original go-ahead, on Jan 3, 2013, from the State Council, for a 5.29-sq-km area, in two parts.